Since its foundation in 1951, Linatex has delivered solutions in technical plastics and rubber to industry - both as worked items / components and as semi-finished products. 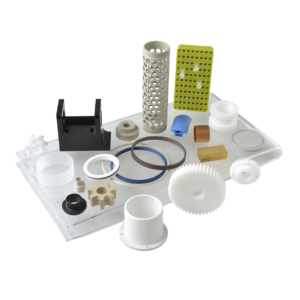 We specialize in demanding applications and use of high performance plastic such as PEEK, PPS, PAI, PEI, PC and fluoroplastics such as PTFE and PVDF, but we also work in standard technical plastics such as nylon (PA), PEHD, PP, PVC, PMMA, POM and PET. In addition, we have hardened plastics like EP (epoxyresin) and PF (phenol plastic) in our program. In addition, we have solid experience in processing and handling food contact materials, including documentation, GMP and traceability.